My hollyhocks are everywhere. Is there a way to kill them? Stop them from spreading? That's funny. I couldn't get mine to stay alive. Sorry. No problem. As the seedlings are not deep rooted just pull them out as they appear. I would encourage you to not try to kill them. I am thrilled that I finally have hollihocks coming up in several places. My neighbor came and dug up some for her house. Do you have neighbors that might like some, or do you have freecycle in your area? 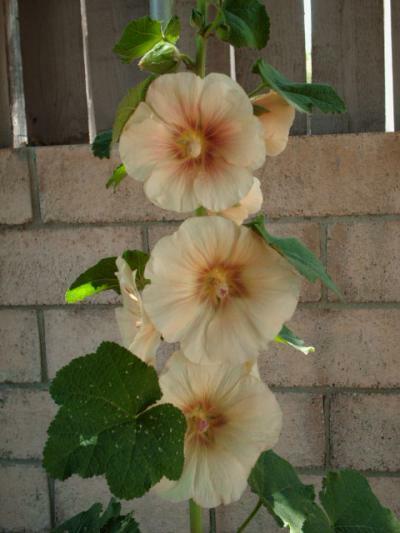 If you post on freecycle that you have some free hollihock plants I am sure, if it is like our freecycle here in OK, you will have several replies. I wish I lived close to you. It seems that most of mine are a pale pink color and I would love to have some dark purple and other colors. Let them bloom, dry the seeds and pull up the main plants. Offer the seeds in the Seeds Seeds Seeds link in this newsletter. No Seeds to fall, no new plants everywhere. plants and others that have them do not want them. We are never satisfied it seems.